Grilled chicken, fresh mozzarella, mesclun greens and balsamic vinaigrette. Roast beef, horseradish cheddar, caramelized onions, bacon and horseradish sauce. Breaded eggplant, fresh mozzarella, red onion, tomato, mesclun and sundried tomato aioli. Halfmoon Sandwich & Salad Shoppe Gift Cards Make a Great Gift for Any Occasion! $10 Gift Card to Halfmoon Sandwich & Salad Shoppe. $15 Gift Card to Halfmoon Sandwich & Salad Shoppe. $20 Gift Card to Halfmoon Sandwich & Salad Shoppe. $25 Gift Card to Halfmoon Sandwich & Salad Shoppe. $30 Gift Card to Halfmoon Sandwich & Salad Shoppe. $50 Gift Card to Halfmoon Sandwich & Salad Shoppe. $100 Gift Card to Halfmoon Sandwich & Salad Shoppe. $200 Gift Card to Halfmoon Sandwich & Salad Shoppe. 3 Eggs, Ham, Bacon, Sausage & American, topped with Homefries on a Hero. 3 Eggs, Roast Beef, Swiss Cheese, Homefries on a Hero. 3 Eggs, Cappicole, American Cheese, Homefries & Hot Peppers on a Hero. 1 Egg, Bacon, Ham or Sausage, Home Fries and Toast. 3 Eggs, Bacon, Ham or Sausage, Home Fries and Toast. Ham, peppers, onions and cheese optional. Omelettes are made with 3 Eggs. Mushrooms, caramelized onions & home fries. Omelettes are made with 3 Eggs. Bacon, home fries & cheddar. Omelettes are made with 3 Eggs. Egg Whites, Turkey & Lacey Swiss. Omelettes are made with 3 Eggs. Omelettes are made with 3 Eggs, and your choice of toppings. Turkey, ham, Swiss, Americano, BBQ and mayo. Teriyaki chicken, julienned veggies, havarti and Asian sauce. Breaded portobello cutlets, provolone, roasted peppers, mesculin and garlic aioli. Turkey, bacon, cheddar and Russian dressing. Grilled chicken, havarti, caramelized onions, mesclun greens and garlic aioli. Breaded chicken cutlet, bacon, cheddar and ranch dressing. BBQ pulled pork, Swiss cheese and coleslaw. Blackened chicken, pepper jack cheese, red onion, lettuce, ranch dressing in a pressed sundried tomato wrap. Salami, ham, cappy, pepperoni, breaded eggplant, provolone, roasted peppers and balsamic vinaigrette on a hoagie. Blazing buffalo chicken breast, julienned carrots and celery, crumbled bleu cheese and wing sauce in a wrap. Pulled pork, ham, Swiss, pickles and deli mustard on a pressed hoagie. Asian roast beef, crumbled bleu cheese, crispy onions, mesclun greens and garlic aioli on focaccia bread. Chicken salad, sundried cranberries, toasted almonds, lettuce and tomato in a whole wheat wrap. Grilled veggies, fresh mozzarella, mesclun and balsamic vinaigrette in a spinach wrap. Prosciutto, fresh mozzarella, roasted peppers, breaded eggplant and balsamic vinaigrette on a hoagie. Breaded chicken cutlet, pepper jack, buffalo wing sauce and bleu cheese dressing on a pressed hoagie roll. Breaded eggplant, fresh mozzarella, grilled asparagus. tomatoes and sundried tomato aioli in a spinach wrap. Grilled chicken, breaded eggplant, fresh mozzarella and sundried tomato on a pressed hoagie. 'The Half Moon" - hot roast beef, fresh mozzarella and brown gravy on a garlic toasted hoagie. Turkey, Ham, roast beef, American cheese, lettuce, tomato, onion and your choice of dressing on hero. Buffalo tenders, mozzarella sticks, curly fries and bacon in a pressed wrap. Served with carrots, celery & bleu cheese dressing. This does not come with cheese, or bacon. It's an 8 oz hamburger. Make it deluxe with lettuce, tomato & fries. Plain, buffalo, BBQ or Teriyaki. Choice of White, Whole Wheat, Rye Bread or Hard Roll. Served with Lettuce, Tomato or Onion at no charge. Grilled whole chicken breast, this is not sliced deli meat! This is Deli Sliced Chicken, NOT a grilled chicken breast. Halfmoon Sandwich & Salad Shoppe is regarded by many as the best sandwich shop in the Capital Region. Home of THE LUMBERJACK breakfast sandwich! There's something on the menu for everyone including a monster selection of Boar's Head Deli Meats, Paninis, Specialty Sandwiches, Wings, Breakfast and crazy good salads. 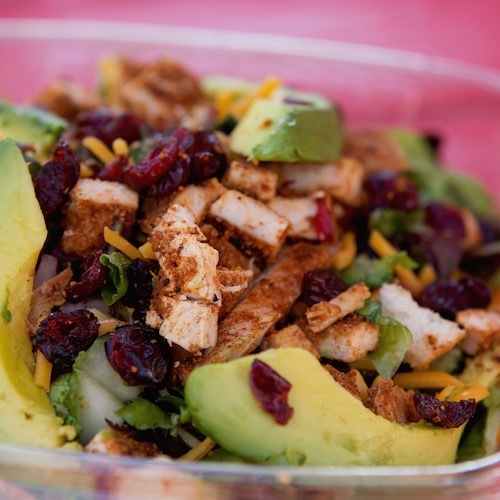 Halfmoon Sandwich & Salad Shoppe has been a Mealeo partner since March of 2014. During that time they've accumulated 3,094 ratings, and earned themselves a 98.7% Mealeo Happy-Factor Rating. This rating is based on order volume, order accuracy, on-time deliveries, customer feedback, and overall customer satisfaction.